Gluten Free Garage is a pop-up gluten-free marketplace that has become a fixture at Artscape Wychwood Barns. For their third edition in Fall 2013, over 65 vendors came together to showcase Toronto’s best gluten-free products. Around 1,500 guests attended to tummy-friendly treats and learn about celiac disease and gluten intolerance. The mastermind behind Gluten Free Garage is Ronnilyn Pustil, who founded the event and hand-selects each vendor herself. Here’s what she had to say about hosting GFG at Artscape Wychwood Barns. On January 23, Target Canada announced $250,000 in funding for Pathways to Education’s Healthy Minds program at an event at Daniels Spectrum, Pathways to Educations headquarters. Michael ‘Pinball’ Clemons was the event’s special guest, inspiring the crowd with his opening remarks and acting as the evening’s master of ceremonies. Guests got to know more about the impact of Pathways programs from youths whose lives had been impacted by them. 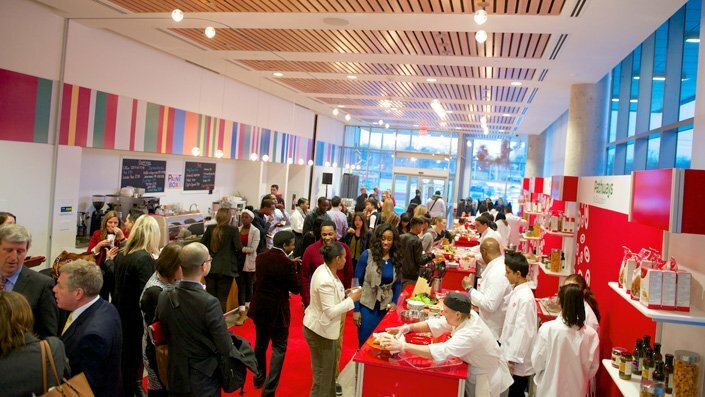 The event took advantage of the built-in bar in Artscape Lounge and augmented the space with bright pop-up counters to accommodate a plethora of tasty treat. Photos courtesy of Target Canada. Last month at Daniels Spectrum, the ACE Bakery Artisan Incubator brought together 20 artisan breadmakers from across Canada to showcase themselves and their products during a weekend in Toronto to celebrate the 20th anniversary of ACE Bakery. It’s the only party we’ve ever been to that had a chandelier made out of baguettes! Daniels Spectrum was an amazing venue for the ACE Bakery Artisan Incubator. It is brand new and boasts state-of-the art technology which helped our bottom line. The staff there was very helpful and accommodating throughout the planning process and was supportive during the build and breakdown as well. Our client ACE Bakery was very pleased with the venue selection and the event as a whole. Check out the full set of event photos on Facebook. The Grid‘s Burger Week is a celebration of all things meat-plus-bun, with more than 60 restaurants around the city creating special edition burgers for just $5. It culminates in Burger Day at Artscape Wychwood Barns, a street party where the restaurants offer slider versions of their special burger, plus side dishes, sweet treats and icy cold beer. On June 2, 2013, people came out in droves on and withstood several rain showers in the name of all-you-can-eat burgers. Over 40,000 sliders were consumed in five hours! You can watch The Grid‘s video recap here.